Are you the owner of a more complex website with specific setup or is it executed on more servers? You have more different business applications or sites that you wish to join at one place? Are you a programming company that needs independent website hosting for its clients or do you need to regularly test applications in an isolated environment? You need an optimal and favourable Disaster Recovery solution? Can you speed up your online business using the latest SSD storage? If the answer is yes then this is an ideal solution for you. 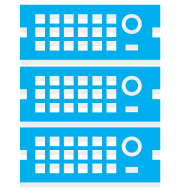 Lease needed resources and create independently virtual servers within your virtual data centre. Distribute as you wish the number of CPUs, RAM memory, the size and type of discs, backup space, network interface speed, internet traffic volume and number of IP addresses. You can create your server as you like it at any time, redistribute resources, expand or reduce total occupancy, plug in and cut out machines as you like it. There is no need any more to invest in expensive equipment to install your business applications or for the purpose of testing. Lease resources when and how many you need, use them immediately and if you don’t need then any more you simply stop or cut off. You can use Cloud Data Centre also as a Disaster Recovery solution with minimum resources, and if there is a need to become a production environment you can expand resources quickly and easily with full capacity. Configure your cloud and independently create VM within your virtual data centre distributing resources as you wish. and independently create VM within your virtual data centre distributing resources as you wish.